This month we are featuring a guest post by Andrew Odom, founder of Tiny r(E)volution. The tiny house movement is filled with wonderful souls and Andrew is one of them. We connected on social media a few months ago and it feels like we've already met. That's the power of the web, my friends. I asked Andrew to help us begin our tiny house project. I told him that we were struggling to get started as financials are always tight. Since he has a wealth of knowledge from formerly living in his own self-built tiny house, I thought he'd be the perfect expert to give readers a realistic outlook at how a couple like us can get "rolling." Have you ever looked up quotes about money and saving money? Most of them read like poor advice from someone who falls into one of two categories. The first category is ‘People Who Save Money To Sit On It.' The second category is ‘People Who Save Money Because They Fear Losing Their Job One Day.’ Nowhere is there a witty quote by someone who saves money because they grew up understanding that need is not the same as want and two pennies earned can easily be a penny saved. Why all this talk about money though? Isn’t this a blog about building a tiny house? Aren’t tiny houses cheap to build? Building a tiny house is cheap. According to The Tiny Life report (2013), the average cost to build a tiny house is $23,000 if built by the owner. This figure does not include the cost of the trailer though. Define your budget a minimum of six months prior to building. Perhaps one of the first mistakes made by someone building a tiny house is lack of preparation. Unless you are independently wealthy or have secured some sort of creative financing, the build is being financed by you. So give yourself time to accumulate build funds. The trailer is the first purchase and perhaps the largest. That should also be the first line item on your budget. Decide what utility trailer you want to purchase, work out a contract with the manufacturer (this will contractually secure a price) and save the money. Now I can’t tell you how to save the money because that is dependent on your personal expenses. But don’t start your tiny house out by credit card or trailer financing. Start out like you can hold out. Go cash-on-the-barrel from the get go. Then continue on focusing on sections. Your second line item should be the drying in stage of your tiny house. Continue through your build making small financial goals that are clearly defined. Then work towards them. It is never too early to start gathering materials. I am not talking about purchasing materials but rather salvaging them or reclaiming them. While you are in that pre-build phase stop at every wood pile you see, every construction zone you pass, and every FREE MATERIALS posting you fine. Look at it like this. 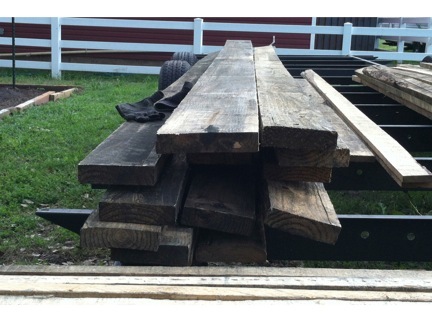 Every 8’ long 2’x4’ you are able to reclaim is a minimum of $2.11 back in your pocket come build time! It is no secret that our tiny house build was made possible through several partnerships. Please note. This is NOT free money. A partnership is a mutually beneficial relationship between two entities. I spent a lot of time approaching sponsors and talking to them about how they could help me and how I could help them. Some signed on and others passed. But for every item donated my wife and I were able to save a little money on materials and in return help a company out that we believed in and believed in their product. Part of transitioning to the tiny house life is downsizing. Before going tiny many of us occupy much larger houses and have the stuff to prove it. So why not kill two birds with one stone. Gather up the items you are ready to part with and sell them, consign them, or trade them. If you sell them in some way earmark that money for your tiny house build ONLY. If you have things like tools, technology, or cookware, consider bartering or trading them for tools you may really need for the build or building materials, etc. You would be surprised how many folks have been wanting to give away that old pocket door in their attic and have also always wanted a stereophonic album of Led Zeppelin Live At The Fillmore! While it seems a lot of people talk about their friends and family not supporting their desire to go tiny a lot of folks have a large support group. Humble yourself and ask them for help. Perhaps your uncle has some old wood he might consider donating. ASK! Maybe you have siblings who each year give you an Olive Garden gift card at Christmas. Ask them to switch up to Home Depot or Menards this year. Heck, don’t be afraid to start a “registry” at a home improvement or big box hardware store and tactfully share it with your parents, aunts and uncles, and even friends. You’d be surprised how many people get a kick out of seeing others achieve their dreams. Funding a tiny house build is not easy. Like everything in this world it costs money and that isn’t always readily available. But don’t become discouraged. Be creative! Never pass up a penny in a parking lot and never be afraid to ask the contractor down the street if he minds you picking through his dumpster! Founder of Tiny r(E)volution and author of the popular book ‘Your Message Here: GAINING CORPORATE SPONSORS for your tiny house project’, Andrew Odom is a social media strategist and content crusader amongst other things. He is also an accomplished photojournalist with work seen in Details, Relevant, South, Kitchen Drawer and Tiny House Magazine(s). His proudest accomplishment however is his long-time adoption of and current advocacy of the tiny house/small house/unconventional house community as a designer, builder, dweller and speaker. Having recently sold their 240 sq. ft. tiny house Andrew and his wife (as well as his 3-year old daughter) live and travel in a 27’ Aruba travel trailer.